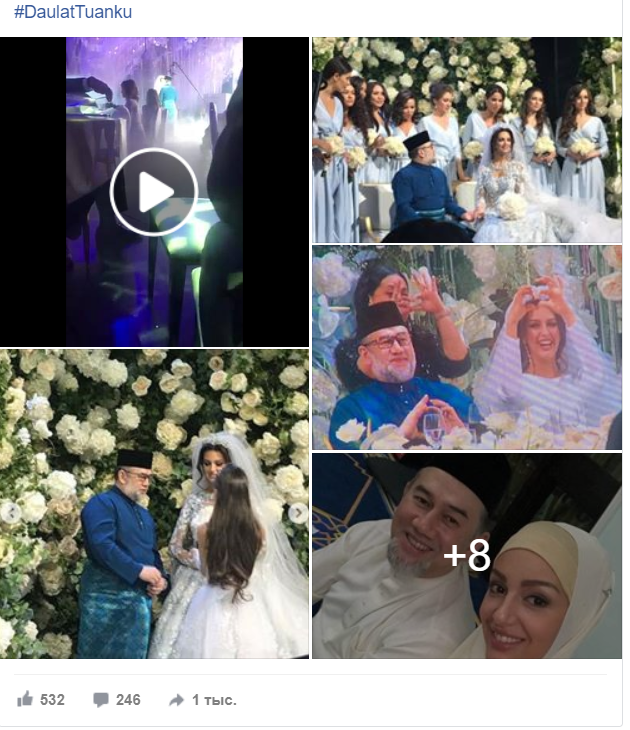 On November 22, the wedding of the 49-year-old Malaysian King Sultan Muhammad V of Kelantan and the 25-year-old owner of the Miss Moscow title, Oksana Voevodina, took place in the village of Barvikha near Moscow. About this reports portal Islam News. The ceremony was held at the Barvikha Concert Hall without alcohol, and all the food was halal. As the newspaper writes, the king came to the guests in the Malaysian national dress, and the bride was wearing a white lush dress. According to the Malaysian edition of Rakyatku News, Voevodina converted to Islam on April 16, 2018 and changed her name and surname to Rihan Oksana Gorbatenko. Her current husband, Muhammad V, was previously married to a royal family member, but divorced her in 2008. They had no children. Polygamy in Malaysia is officially allowed, but is extremely rare. According to media reports, after the wedding, Voevodina will not get the royal title, as it is assigned only to the indigenous Malaysian. "Miss Moscow 2015" married the King of Malaysia. What is known about Voevodina? Voevodina was born in Rostov-on-Don. She graduated from the magistracy of the Faculty of Business RSUU them. G.V. Plekhanov. At 22, as a student, took part in the beauty contest "Miss Moscow" and won it. According to her, she came to the contest by chance, she was invited by her friend, Voevodina was selected, but her friend was not. After the victory at Miss Moscow, Voevodina said that wanted to eat a “big-big cake” as a reward for her efforts. “I had to eat right. We were so loaded that we didn’t have enough time to go to fitness. But thanks to our rehearsals, I took off even more than I needed: the dress falls off, ”TJournal quoted her. After graduation, Voevodina worked as a model in Russia, the USA, Italy and China. She is fluent in English, enjoys photography and design of clothes and accessories. Earlier, the media reported that the girl dreamed of becoming a TV presenter and launching her own clothing line under her own brand.